The Census Bureau's American Community Survey (ACS) asks a broad range of intrusive questions. The ACS is mailed to 3 million homes every year. Failing to disclose the information requested is a federal misdemeanor punishable by a fine under 13 USC 221. 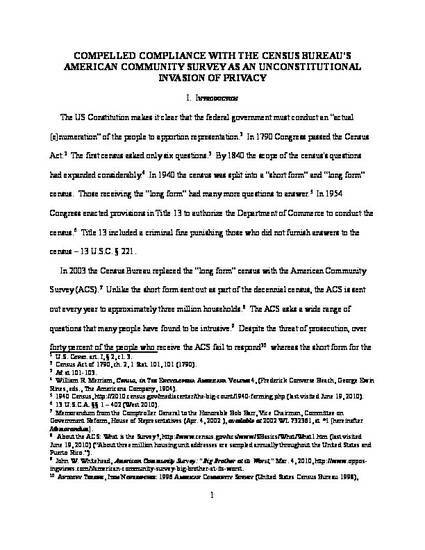 This article argues that when prosecuted under this statute an individual's best defense is asserting that the individual's right to privacy outweighs the government interest and that this law, as applied in the context of enforcing compliance with most questions on the ACS, is unconstitutional.